Julia looked up as her sunlight was blocked and saw Chrístõ standing above her with two long, cool drinks of the sort that contained lots of fruit and were decorated with paper umbrellas. She sat up under her sunshade and accepted one of the glasses. Chrístõ sat on the sunlounger next to her and sipped his drink. Julia made a disgusted face. “I’ll stick with fruit juice.” She sucked the more suitable drink through a long straw and smiled widely as Chrístõ relaxed beside her. “It’s not really suitable for a sun cruise around the equatorial islands of Beta Delta IV’s ocean,” he answered. They both did. She was in a bathing suit and a sarong, as she had been for all of the two weeks of their holiday so far. He was in a pair of pale blue shorts and a multicoloured cotton shirt that was open to reveal a chest that had started white, but was now tanned a healthy light bronze. He was wearing sunglasses that hid his eyes. “Good different or bad different?” he asked. Was he telling her or himself, he wondered. He was living a Human life so much lately that he wasn’t sure. He was happy enough with the life. He liked teaching. He liked living as a part of Julia’s family. He liked Beta Delta IV, a planet he learned more about every time he had a chance to explore part of it. Yes, he could live as a Human. But did he want to? “Drinking cocktails on a cruise ship?” Chrístõ deliberately read her comment the wrong way and made light of it. “Living an ordinary life,” she insisted, ignoring his joke. “You, as a teacher, working day by day, taking summer holidays like this. If… if you had to stay here and live this life, would it be so bad? If we got married here on Beta Delta IV, in an ordinary way, and had a house of our own, and a car, and we both worked – I could teach, too, maybe – at least until we were ready to have children… would that be so bad? Yes, Chrístõ thought. My soul would die if that was my only option in life. I was meant for much more. I'm a prince of the universe, a guardian of time. I’m not the bloke next door. I don’t want to spend my life mowing the lawn and doing DIY and saving for a holiday in the sun once a year. I don’t want to be Human if that’s all being Human means. And he knew that was a snobbish, mean thing to think. But the idea did repulse him. It wasn’t that he missed living in a mansion with servants tending to his needs. It wasn’t that he felt he ought to be attending grand balls with all the trappings of aristocracy. He had left all of that behind long ago. He had been content with much simpler lifestyles; the years he had spent with the Shaolins, eating rice and fruit and sleeping on a mat on the floor, his ‘room’ in Victorian London that was as basic a life as he could make it. Yes, he could be happy without luxury, without money, without Gallifrey. But only so long as he knew those things were there if he wanted them, when it was his choice to turn away from them. “No,” he lied as Julia watched him from behind her own sunglasses and waited for his reply. “No, it wouldn’t be so bad, as long as you were with me.” He leaned over and kissed her, tasting the fruit juice on her lips. She didn’t mind the taste of rum second hand on his, either. But it was a quick kiss. She wasn’t ready for anything more, yet. This talk of marriage, children, a home together, was still academic. “You mean, like, we might not get engaged?” Julia looked worried. He left her lying back on her sunlounger and went to the bar where the drinks and elaborate ice cream sundaes were prepared. He turned and watched her while he was waiting for the ice creams to be made. She, in turn, was watching him. She waved to him. He waved back. The bar steward asked him if it was all right to put nuts in the sundae. He turned to answer. When he turned back, Julia wasn’t on the sunlounger. He looked around, expecting to see her approaching, impatient for her ice cream. When he didn’t see her, he looked at the swimming pool where a few people were relaxing on colourful airbeds or swimming slowly and leisurely, rather than as a serious sport. She wasn’t there, either. He brought the drinks and ice cream to where they had been sitting and looked around again. There was still no sign of her. He waited a few minutes, in case she had gone to the toilet, the most obvious explanation, then he began to be concerned. Why would she leave the deck just like that, without telling him? He went to look on the upper deck where she had taken part in tai chi and callisthenics classes most mornings, but there was nothing going on there at the moment. She was nowhere in sight. He checked their berth next. She wasn’t in the sitting room, or her own bedroom, and just to be sure, she wasn’t in his bedroom either. Or either of the en suite bathrooms. He went back to the pool deck to see if she had come back. The ice creams were melting and the cocktails warming up in the sun, and there was no indication that she had come back at all. He found a Steward and told them he had lost his girlfriend. A few minutes later there was a tannoy announcement around the ship asking her to come to the pool deck. After fifteen minutes with no response, the Steward contacted the bridge. 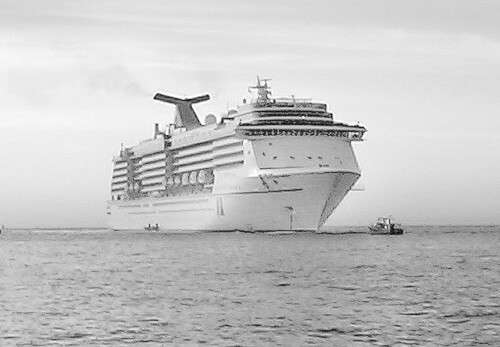 A few minutes after that, the cruise liner began to stop. It was at least three quarters of an hour since she went missing. If she had fallen overboard, then she did so fifteen or twenty miles back. There was, as the Steward tried to explain diplomatically, no hope of finding a body. “She didn’t fall overboard,” Chrístõ answered that. He completely refused to consider that possibility. It was absurd. In the few seconds he was turned away, she could not have fallen overboard. But then, where was she? He wasn’t the only person asking that question, now. The ship’s crew were mobilised to search for a missing girl. The crew and passengers were asked to muster at the lifeboat stations as if for a fire drill and they were all shown Julia’s picture and asked if they had seen her. The ship was searched. It took hours. The passengers grumbled. The crew distributed free drinks and food to placate them. But Julia was nowhere to be found. “But she couldn’t have just vanished,” insisted the Chief Steward, who was as anxious as anyone else to find the missing passenger. A teenage girl, at that. It hardly looked good for the company. That was true, of course. Chrístõ WAS one of the rich, first class passengers and he had noted that particular measure in the brochure. But he wasn’t reassured. He knew well enough that there were ways around any kind of security. His TARDIS was capable of circumventing a transmat shield. It was perfectly conceivable that other technology existed that did the same thing. A Steward went with him as he decided to go to his suite. He changed from his shorts and shirt into his usual, familiar clothes, including his leather jacket, with his sonic screwdriver in the pocket, then he went back up to the now empty pool deck. He stood by the sounloungers where he and Julia had been perfectly happy every day of the cruise and concentrated hard, first of all. Yes, now he thought about it, he could sense something. There was some kind of energy. He used his sonic screwdriver to take a reading. It had been hours. But there was a trace. Enough to prove that the ship’s anti-transmat barriers had failed. He reported his findings to the Chief Steward. He, in turn, reported that to the Captain. An immediate investigation of the computer record of their journey showed that there had been a brief moment, a very brief glitch, when it was just possible that the anti-transmat field had collapsed. For no more than a few seconds… microseconds. He was interrupted by the arrival of a very young crewmember, possibly a midshipman. Chrístõ wasn’t entirely sure how the ranking system worked on a passenger liner owned by a private company. But his eyes were not on the number of pips or stripes or anything else on the very neat uniform, but the boldly coloured length of sheer silk that he held bunched up in his hand. He recognised it as the sarong Julia had been wearing. “Where was that?” he demanded. “It was outside the door of the captain’s private cabin,” the midshipman answered. “There’s a note…” He held up a piece of paper. The captain reached for it, but Chrístõ was faster. It was written in an Earth alphabet, he noted. But the words were Gallifreyan. It WAS possible to transcribe their language using a combination of the 26 character standard plus the Greek alphabet. It went on to inform him that, if he wanted to see his Human plaything again he should come, alone, to a location which the Chief Steward confirmed as a luggage hold, on deck 15, where the suitcases and trunks of the passengers were taken once they were unpacked. None of the passengers would have access to that area. Few of the crew would have need to go there once the ship was at sea. “I will contact the authorities at once. A police hovercopter can be here within an hour,” the Captain assured him. “You don’t,” the Captain told him. “I am not going to allow another passenger’s life to be put at risk.” But Chrístõ gave him a hard stare, with the full force of his Gallifreyan aristocratic blood behind it and repeated his question. The Captain insisted that he had at least four men, all armed, with him. Chrístõ pointed out that the message insisted that he come alone, but the Captain would not budge on that issue. In any case, he did need somebody to show him where this luggage hold was. The modern turbo-lift made short work of the fifteen floors down to the service decks, of course. They emerged into a narrow corridor, lit by simple strobe lighting, very different from the luxurious, carpeted levels of the passenger decks with ornamental light fittings. Flanked by the four armed men Chrístõ walked past storerooms where food and linen and all kinds of essentials were stored. The luggage hold was the least important during the voyage and was at the far end of the corridor. They were only halfway there when a man appeared in front of them. He hadn’t used any kind of technology. But he moved so fast they barely saw the door open and close before he stood there. He had a weapon in his hands. The four guards protecting Chrístõ raised theirs. Two of them stepped in front of him, dutifully. 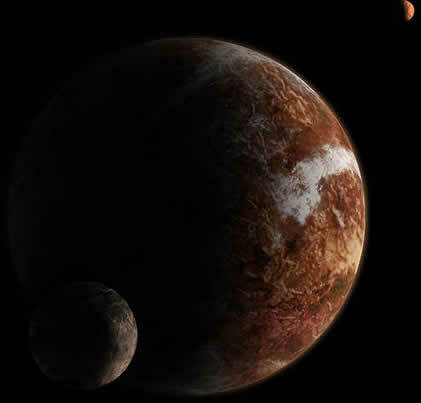 “I said, come alone, Prydonian,” said the man in Low Gallifreyan. “The Captain insisted,” Chrístõ replied in the same language. “Then the Captain will rue his disobedience.” The man’s voice was cold. Chrístõ called out to him not to shoot, but it was too late. He felt the heat of the energy weapon as it fired twice and the men in front of him fell dead. The other two managed to squeeze the triggers of their projectile guns, but their shots went wide as they, too, were killed in an eyeblink. Chrístõ screamed in anger and grief at the waste of four lives. There was no answer. But the man held up something that looked much like a sonic screwdriver in the hand that wasn’t holding the weapon. Chrístõ watched in horror as Julia emerged from the luggage hold door, apparently unharmed, still wearing nothing but her bathing costume. She seemed to be almost sleepwalking, under the control of her kidnapper. “Go,” he ordered, and she walked slowly. Chrístõ’s hearts almost stood still. The kidnapper had his fearful weapon trained on her back. If he made any kind of movement he could kill her in an instant. He didn’t dare even move closer to her. As she drew near he saw the kidnapper do something with his sonic device and Julia’s eyes flickered. She gave a cry and ran the last steps to his arms. “She goes free in exchange for you, Prydonian,” said the kidnapper. She sobbed with fear for him, but she did as he asked. That was all he had ever asked her to do, and she did it. He didn’t dare look around. He was watching the kidnapper, watching his weapon, ready to put his own body in front of hers if there was any hint of a double cross. He heard her running footsteps and her sobs recede and then the hum of a turbo lift. “Now, you. Move forward. Into there.” Chrístõ’s eyes flickered once to the projectile weapons the dead men had dropped. But he knew he wasn’t fast enough. He did as the man said. He stepped forward, as he stepped backwards, the weapon trained on him at all times. He stepped into what very clearly was not the luggage hold. He felt the dimensional transference as he crossed the threshold. It wasn’t a TARDIS, either, though it seemed to have some TARDIS-like technology involved to make the room much bigger than it had a right to be. There was a bank of controls and a large viewscreen along one wall, not like a TARDIS with a central console. There was a chair in the middle of the room that was bolted to the floor and had manacles and hand cuffs. Chrístõ screamed as the sonic device was aimed at him. It had almost the same effect as a neural inhibitor, except that it didn’t stop him walking, only determining where he could walk. He struggled against it. But it was too powerful. This was a weapon designed to be used against a Time Lord. He couldn’t help himself. He was forced into the chair. His arms and legs were shackled. Proud words. And he meant them. He didn’t know what sort of tortures the Mallus might employ against him. He wasn’t going to frighten himself by trying to imagine it. That in itself would be a torture and a weakness that would strip his courage from him. “Ah,” Chrístõ thought with relief. So it still eludes them. How, he thought, could any Gallifreyan do that? What was power without honour? Honour came first with every one who passed through the Time Lord academies. Even his cousin, Epsilon, who he thought was the worst Time Lord he had ever known, had more honour that that. Even he wouldn’t conspire against Gallifrey itself. He cared little about any other planet or any other people, but even he would never do that to his own world. No, even the Oakdaene House would bow its head in shame at such an act of treason. The traitor turned away from him. Chrístõ couldn’t see what he was doing. But he could feel the ship’s engine begin to power up. No, not a TARDIS, he thought. Something much simpler. It had the ability to dematerialise and rematerialise, of course. That was how it had got aboard the cruiser disguised as the entrance to the luggage hold. But it didn’t have vortex capability. It could only move in space, not time. It was something obsolete, perhaps used by the Gallifreyan freight service or even a prison transporter. Something very low grade that did not need the symbiotic imprimatur of a Time Lord to pilot it. “I am not a failure!” the traitor screamed. Chrístõ felt his anger telepathically. It was hurled at him like a weapon. But that was his mistake. Because Chrístõ was right. The traitor was not a transcended Time Lord. His telepathic abilities were rudimentary and untrained. And Chrístõ’s had been honed and trained even beyond the classes at the Prydonian Academy. Maestro and the Brotherhood of Mount Lœng, Li Tuo and the many games of multi-dimensional chess they had played, all of that made him fully able to block such an attack and to turn it on the attacker. The traitor’s head was seared as he failed to block. He screamed again, this time in pain. “I’ll kill you!” he cried out and Chrístõ heard his footsteps behind him. He steeled himself for a physical blow, perhaps a knife in his back or a blunt instrument to the head. Physically he was powerless to stop such a blow. The device that partially paralysed him prevented him from defending himself against any such attack. But not mentally. He reached out, this time not merely in defence, but psychically attacking his enemy. His blow again seared the traitor’s mind. He cried out in actual pain and Chrístõ saw the energy weapon that had already murdered four innocent humans slither across the floor by the chair. The setting was reduced to act as a painful electronic shock when administered directly to the flesh. Despite the traitor’s insistence that he would kill him if he didn’t co-operate, it seemed The Mallus really didn’t want him dead just yet. But The Mallus could wait. 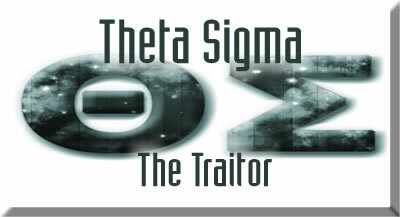 The Traitor, first. He felt his bare hands close on his neck and reached again, mentally, to stop him. And he did something he knew how to do, but had never, in his life, practiced on any subject. He forced himself into the untrained mind that was already partially stunned by the two psychic attacks on it, and he compelled him to let go. He took control of the Traitor’s mind and bent it to his own will. He felt slightly horrified that he could do that. It was a terrible thing to rob anyone of their free will. But his own free will had been robbed when he was taken hostage by this man, and he salved his conscience with the knowledge that he did this, not just to save himself, but to save his world. “Free me from these bonds,” he ordered, and The Traitor had no choice. The full power of Chrístõ’s will bent his own. He unfastened the physical bonds, and with his sonic device he released him from the paralysis, too. Chrístõ moved quickly, his body honed as his mind had been, by the disciplines of Shaolin and Sun Ko Do. In a few swift movements he had The Traitor physically under his power. He grabbed the paralysing device from him and applied it. The Traitor screamed again. “A coward, like I said,” Chrístõ noted as he hauled him up and placed him in the same chair he had been held captive in. “You are in no more pain than I am, yet you whimper pathetically. They called me the weakling.. But you…” Chrístõ resisted the urge to hit him physically. And it took a lot of resisting. This, after all, was the man who had betrayed everyone on his home world. The death of so many good people, the President, Hext’s uncle, who died so bravely, setting an example to them all, Lord Drogban, who died saving young Prydonians from the burning building, and so many others. Maybe even his own father. He had heard nothing for months, and what he had heard last was that his father was part of the resistance. He could be dead by now. He had every reason to physically hurt this man who was directly responsible for all of that. But he didn’t. “A second son of a second son!” Chrístõ nodded as if some of it was starting to make sense. Two sons in an Oldblood House were always problematic. That was why Garrick’s birth had been such an crisis in his own life. But when the second son who did not inherit land or title, himself had two sons, there were bound to be problems. “The Mallus will tear you to pieces,” The Traitor answered him defiantly. He cancelled the automatic navigation programme and took over the controls. It was far more simple to pilot than a TARDIS. He could manoeuvre it easily. He plotted his next course and then turned to the communications panel. It took a few minutes to connect to the slightly incompatible system on board the cruise ship he had been kidnapped from a little over an hour ago. He spoke first to the Captain, assuring him that he was safe and expressing his sorrow for the deaths of his four men. He told him that the killer had been detained, but gave no further details about that. He didn’t want the prisoner handed over to the Beta Deltan authorities. His crimes against Gallifrey were greater than his crimes against those four men, and he would pay for them before a Gallifreyan court. He needed, most of all, to speak to Julia. She came to the videophone wearing the midshipman’s jacket over her bathing costume. She was crying openly now, but he couldn’t help that. She would have her family to look after her, at least. “Don’t get excited, sunshine,” he said as he closed the communication and turned to check on his prisoner. “We’re going back to Gallifrey, but you’re not going to look at its sky for a very long time.” He turned back to the communications panel and made another connection. Penne looked as if he might ask who the prisoner was, but decided that could wait. He nodded to somebody near to him and told Chrístõ the Ruby’s flight plan would be coming to him by secure burst transmission. He closed the communication feeling far more buoyant than he expected to be. He wasn’t in any sense happy to be going to war. But after all the waiting, all the anxiety, all the not knowing, he was at last going to be able to do something.